Junction City was settled in the 1850s and was originally known as Milltown due to the sawmill located at the settlement. As the new decade approached, the first wagon roads into the Trinity region were being built, first from Shasta to nearby Weaverville, then to Oregon and other communities that were being established in the Trinity goldfields. The settlement known as Milltown found itself at the junction of these important new roads, and in 1861 the growing camp was renamed Junction City. Prior to the construction of Trinity Dam in 1961, the Junction City area was prone to severe flooding. The worst flood hit the same year that Junction City celebrated its new name. The 1861 flood destroyed everything within 100 feet of the river. The Trinity Journal detailed the destruction of this devastating flood. The river at Junction City "became an ocean, spreading from mountain to mountain, sweeping in its furious current farm houses, miners' cabins, mills, men, women, and children; in very truth all that was animate and inanimate." 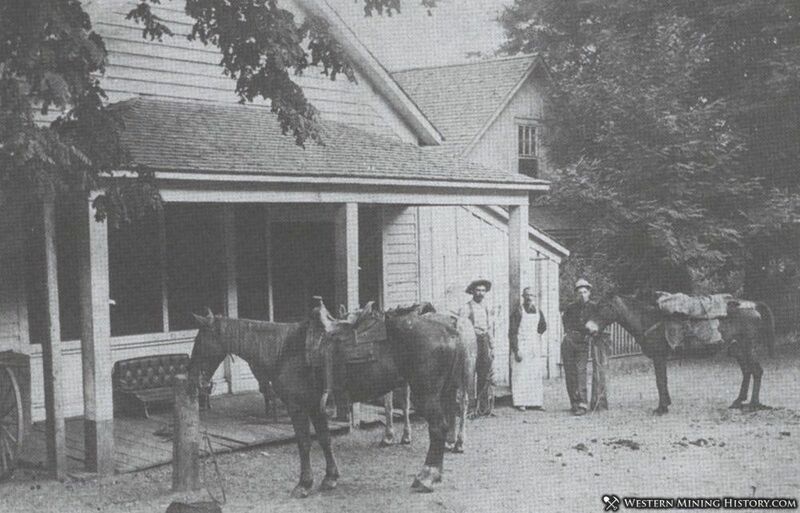 Despite Junction City's location in a frequently flooded valley, the town continued to grow through the latter decades of the 1800s. 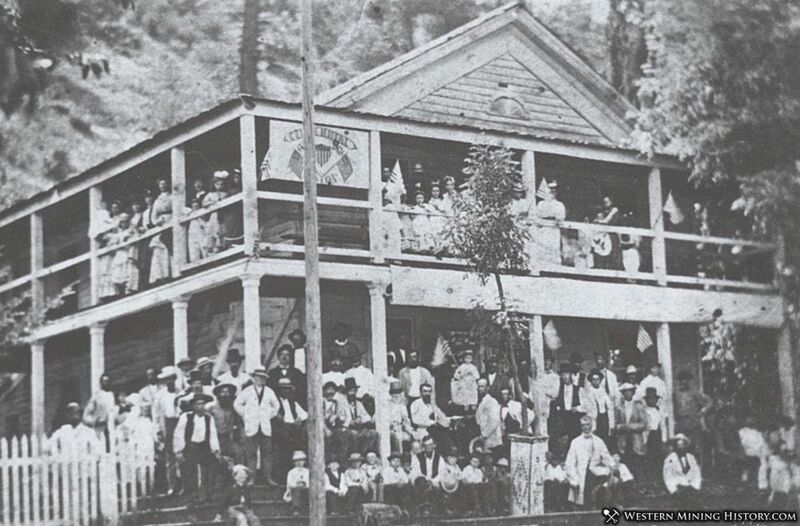 Floods may have been devastating, but they were no match for persistent pioneers determined to profit from the rich Trinity gold mines and the trade they brought to the region. In addition to being the crossroads of much of Trinity County's vital transportation routes, Junction City was also the site of many rich placer mines. As placer mines ran out, hydraulic mines became more popular starting in the 1870s. 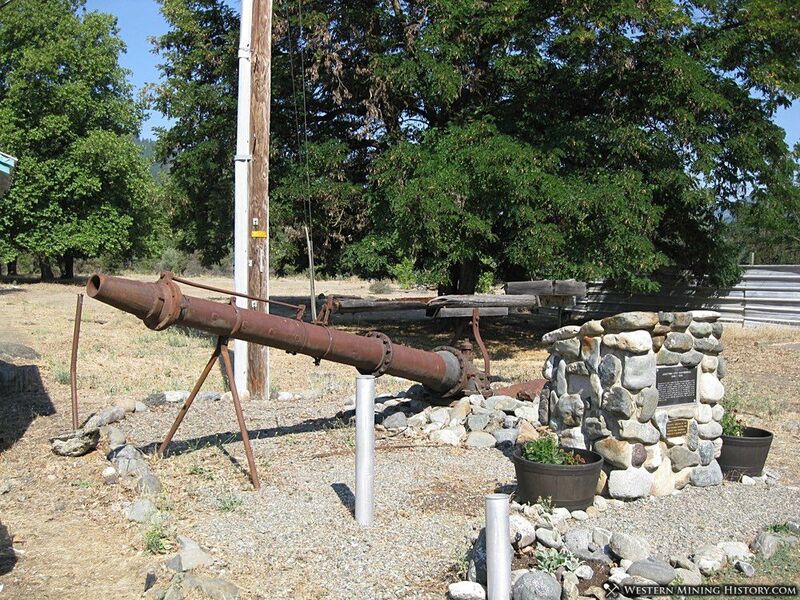 Many large hydraulic mines operated in the vicinity of Junction City, and today the town has a historical marker with a hydraulic monitor on display as a reminder of the town's golden past. Starting in the 1880s, hydraulic mining operations began transitioning from small independent operations to large operations financed by distant capital. These larger operations took on major infrastructure projects, building flumes tens of miles long to bring water to new hydraulic mining sites. These mines employed many men, and as a result Junction City reached the peak of its prosperity in the 1890s. A fire in September of 1897 burned most of the commercial buildings on Main Street and destroyed one-third of the town. The Carter House hotel, depicted in the photo at the top of this page, was one of the iconic buildings lost in the fire. With hydraulic mining still in full swing, most of the town was rebuilt by the end of the year. Fire would strike again in 1908, once again destroying the same blocks that had been rebuilt following the 1897 fire. By this time the mines were no longer operating at the scale they had been in the previous two decades, and instead of rebuilding many residents left town for good. Junction City continued to decline as the mining industry slowed down during the first few decades of the 1900s. The first highway was built to Junction City in the 1930s, but by this time not much was left of the original town. We are informed by A. J. Feller that John Dacy, at Junction City, has just struck very rich prospects in the upper bench, between the old Dacy claims and Fegan's claim. We know that prospectors have heretofore found as high as eighteen cents to the pan in this bench, but no water could be had to work. The ditch of Fegan & Dacy, from Clear Gulch, t covers the ground in question, and there is reason to look for gratifying reports from there before long. We further hear that McKinney & Co. have found richer ground in the second bench above Price's Bar than that heretofore worked. Junction City is just now taking the lead of other districts in the county, which is accounted for from the fact that more prospecting is done there than elsewhere. Some of the richest claims in the county are within a mile of that town, and in point of business it is second only to the county seat. It will continue to improve. A. T. Corbus furnishes us with the gratifying information that all the damage done by the December storm at Indian Creek has been repaired. Every dam in the creek was carried away, and the fact that they have all been repaired, and the ditches put in working condition in the short space of a month, speaks well for the enterprising miners of that district. The mountains at the head of Indian and Redding's creeks are covered with a great depth or snow, and the mindications for a successful mining season were never better. About one hundred and fifty men are employed in the Indian Creek mines at present, and the number will be increased when the new hill diggings, lately discovered, are fairly opened.